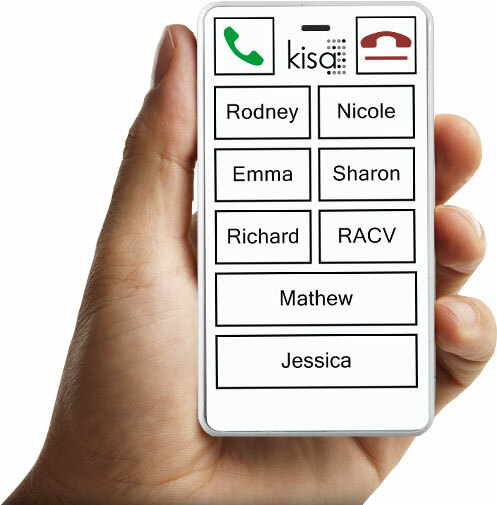 Here at KISA we wish to make mobile phones accessible to everyone and we have taken a great care to make sure that our phone is simple and easy to use even for people with limited dexterity or arthritis, because we all want to stay in touch with our loved ones. We spent a considerable amount of time making the KISA phone suitable for people with various physical limitations. KISA phone was designed with large, easy to press buttons and a loudspeaker for hands-free operation. It is light and durable when dropped and has vibration feedback when buttons are pressed to avoid any confusion. We have also included a cradle for easy charging and storage, very similar to the way most land-line phones operate at home. The cradle can be glued to a table with double-sided tape to make using it a one-hand operation. KISA phone is large enough to be gripped comfortably, but light enough to be worn on a lanyard that we have also provided.